There is something so special about sending your loved one a personalized gift. 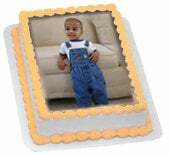 Now you can have any image you chose printed on a Kapruka cake. You can use one of your own photographs, or select a photo from the Kapruka gallery. Kapruka always uses high quality ingredients and world class icing printers. The cake you have carefully chosen will be delivered in an elegant Kapruka bakery box. Your greeting Limit this to 30 characters.